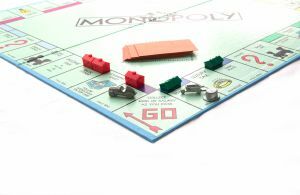 I recently found myself playing a game of monopoly with my family. A game I haven’t played since I was a kid, I didn’t even remember the concept! I decided I would learn as we played. What I realized was that the more I learned, the less I wanted to play. Monopoly is a game that really makes you think. The fabulous thing about teddy bears is that they come in all shapes and sizes. Whether it’s a huge teddy bear that’s bigger than you or a small one for you to hold close, a teddy bear is a child’s best friend. Children’s love for teddy bears starts at a very early age. When I was little, my teddy bears slept all around me to protect me at night. Some children carry their teddy bears everywhere they go. Some treat them like their best pal while others treat them like it’s their baby. My two year old nephew has a teddy bear named Charlie. Charlie gets burped, has his diaper changed, and gets put in the swing when he’s crying. But teddy bears aren’t just for children. Many adults have collections of teddy bears. Those collections can contain hundreds of bears in multiple colors and costumes. 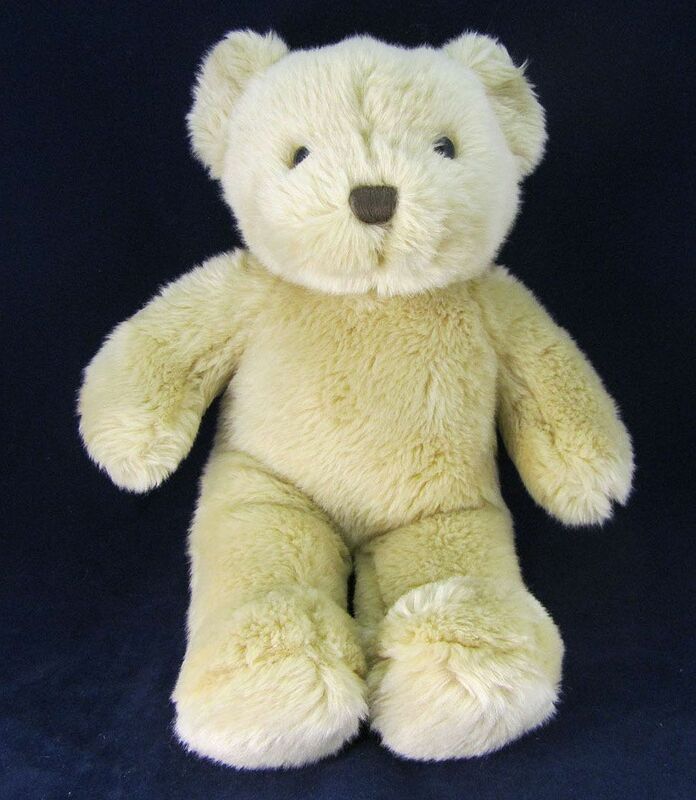 Teddy Bears are also used quite often to decorate the house or spare bedrooms. There is only one thing cooler than a teddy bear, and that’s a Care Bear. Care Bears are different than teddy bears in a few ways. First, Care Bears have cool powers that regular teddy bears don’t have. Second, Care Bears are made of fun, bright colors, with different symbols on their tummies. Third, they teach children about feelings and about caring for others. Care Bears live in the Kingdom of Caring and go on missions using the symbols on their tummies to ignite the Care Bear Stare and emit a shooting light onto the villain. That light brings caring, happiness, and love onto its target. With the teddy bear and Care Bear having so many great features, how do you choose? You don’t, buy both!! Do you want to add more flavor to your dishes? No problem since all you need is a citrus zester on hand. For those not familiar with the kitchen utensil, it’s a small grate that’s used in cooking to release small bursts of concentrated flavor from things like citrus rinds, nutmeg and cinnamon sticks. It’s more slender than a rasp grater and has smaller holes, allowing it to make hundreds of fine cuts on whatever item you want to get a burst of flavor from. Used for added flavoring, freshly-grated lemon or orange zest can easily transform an ordinary recipe into a savory dish. Many use them for lemons and limes, making them idea to get the flavor without adding the pith (the bitter white part of the skin of the lemon or lime). Citrus zesters feature five or six holes and are great for making lemons curls for things like espresso or even martinis. One medium-sized lemon is approximately one tablespoon of lemon zest, which is the same as two to three tablespoons of lemon juice. 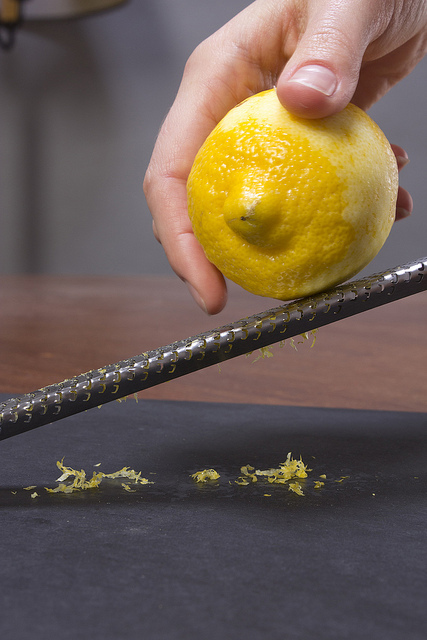 When using a lemon for both zest and juice, make sure that you grate the zest first before you squeeze out the juice. 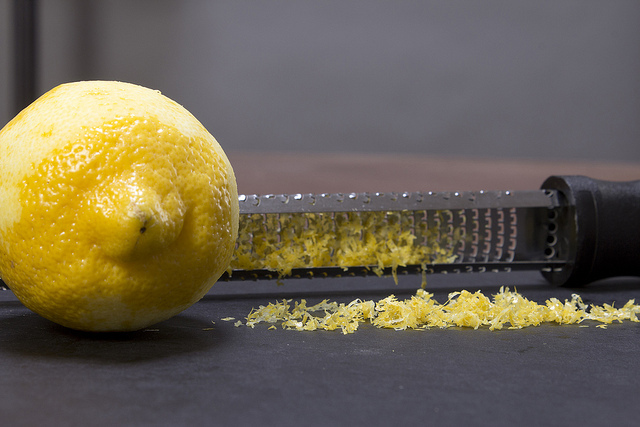 Here’s a fast and easy trick to make it easier to zest: cover the zest side of the grater with some plastic wrap and then grate the citrus (lemon, lime or orange) over the plastic wrap, without grating the bitter white pith. The zest will stay on the plastic wrap and won’t stick in the holes of the zester. Then simply pull of the wrap and shake the zest into your recipe or a plate. Here’s a delicious recipe that requires some lemon zest! Preheat your oven to 350 degree and line cookie sheets with parchment paper. Mix together butter and sugar until it’s light and fluffy with a hand or stand mixer. Add in the lemon extract, juice and zest from the lemons and eggs one at a time. Mix until it’s smooth. In a separate bowl, mix baking powder, sea salt and flour. Combine all the wet ingredients to the dry and fold together. Mix until it’s all combined. Make balls of cooking dough using a 1 Tbs scoop. Roll the ball in the lemon sugar to coat and place on the cookie sheet about 2 inches apart. Press lightly on the cookies with the back of the spoon to smash down. Bake for 12 minutes or until they start to get brown. Allow to cool for about 3 minutes before moving to cooling rack. Candle Douters: What Are They And How Were They Used? Before we had rechargeable lamps, flashlights and light bulbs, we navigated through the dark with just the humble candle. Although candles may seem primitive to us now, they were infinitely useful for lighting up any room during the early days when our forefathers had no electricity. They made it possible to get things done even after dark. And then they could easily be extinguished when they weren’t in use. But did you know that people used to have a different way of putting out lit candles? Back then, they had tools called candle douters or candle snuffers. As the name suggests, they snuffed out the flame of lit candles. There are two main types associated with candle douters. One is shaped like a bell or cone attached to a rod handle, while the other type looks like an oversized pair of scissors with a box compartment attached to it. Although both of them are commonly referred to as candle douters, they actually serve different purposes. Bell-shaped douters were designed to put out fire by smothering it. You cover the flame with the bell and the flame dies underneath it. In a clever use of scientific principles, these candle douters work by depriving the flame of air. Fire needs oxygen in order to burn, and by covering it with the douter, you cut off its supply of air–no oxygen means no flame. Bell-shaped candle douters were useful for snuffing out candles without blowing it out and possibly burning yourself from the candle’s hot wax. They also prevented the spread of smoke which happens when you blow a candle out. The main purpose of the scissor-shaped douters wasn’t to put out the fire. They were actually used to trim the candle wick. You see, in the old days, candles had a design that made it harder for the wick to be burned down completely. This meant that you needed to snip off the excess wick after each use. The box appendage on the scissor douters were meant to catch the trimmed threads. Trimming often caused the flame to be extinguished. So it’s easy to confuse it with the bell shaped candle snuffers that were designed to put out the flame. However an experienced person could snip off the wick without extinguishing the fire. These days however, scissor shaped candle douters have fallen out of use after braided wicks were invented. The braiding encourages a slow consistent burn that not only conserves the candle but also encourages the wick to curl back into the flame as the candle burns down. This meant that the wick gets burned more so less charred excess wick needs to be clipped off. This eliminated the need for scissor douters to snip off the wick. Once used widely in the 18th century, bell-shaped and scissor-shaped candle douters are a rare sight in regular homes now and are just used mostly for special occasions and rituals. These douters can be found in churches though, where they are used for putting out the fire from tall or hard to reach candles at the altar. Also, candle douters are still valuable pieces in antique enthusiasts’ collections. For some, the classic designs of these tools have an elegant vintage charm. Others have newer douters that come in different designs and shapes. They can look like animals, people, flowers and more. Some even have unconventional designs like automatic snuffers that you can attach to the candle. What do you think of candle douters? Do you have one of your own? Let us know about your experience with these historical tools. Aside from Candle Douters, we also have candle holders in our ebay store, The Escape Place. Check out our page for cool candle holders. There are many selections available for tableware among which bone china is considered to be the finest – especially by porcelain standards. The finest of porcelain products, it is stronger, more durable, harder and more translucent than other varieties of porcelain. Many houses have at least one, if not many pieces of bone china. They consider these to be a very important part of the family history, as bone china can stand the test of time and be handed down from generation to generation as heirlooms. By the end of the 18th century, an Englishman named Josiah Spode, pioneered the use of calcined bone ash in making bone china pieces. This technique, which adds bone ash to china mixtures, has flourished in the works at Spode as well as many other china manufacturers including Lenox, the only manufacturer of bone china in the United States. The addition of bone ash, especially cow bone, gives bone china a warm color in contrast to fine china being a brighter white. The bones are finely ground into bone ash and then mixed with feldspar, ball clay, quartz, and kaolin (a type of clay). 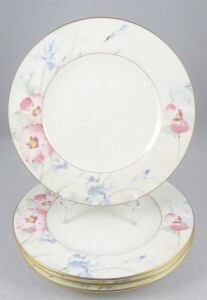 The quality of the finished bone china product is determined by the amount of bone in the mixture. 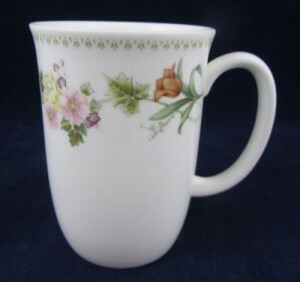 High quality bone china must include at least thirty percent bone with the highest quality range as high as forty to forty-five percent of bone composition. ¬Creating bone china is a very interesting art which involves a series of carefully planned steps only done by highly skilled artisans with machinery. Generally speaking, earth (the raw materials), wind (for companies who utilize air hoses in the manufacture of their products), fire (the kilns), and water (used during every process) are all required to make bone china. After the accurate preparation of the mixture of the purest of raw materials, the piece is shaped and molded into the desired items. They are afterwards exposed to a series of firings at extremely high temperatures and for long periods of time. The nature and specific design of the pieces determine the number of firings required. In the process, the bone china piece is made stronger by making it softer and less brittle. Thus the bone ash, which adds to the translucency of the product, makes it more resilient to damage and less likely to break. 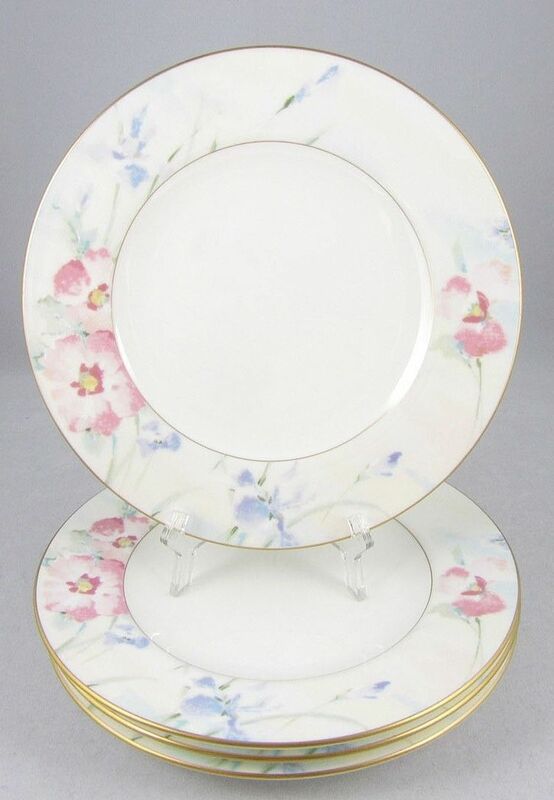 Check out our ebay store, Escape Place for the bone china pieces. The leaves have changed colors and fallen from branches, the wind has gotten colder and colder with each passing day. Christmas carols have started to filter from every business that you go into. Yes, it is that time of the year once more and you will want to start shopping for gifts now to avoid the crowds at the malls. You may argue that all the best deals are at the malls, yet that is where you are wrong. You can also find great deals online and you do not even need to leave your home. Why brave the chill on the streets and the crowds at the malls?